S.A.T.B and Organ. Composed by Lowell Mason (1792-1872). Arranged by Gilbert M. Martin. 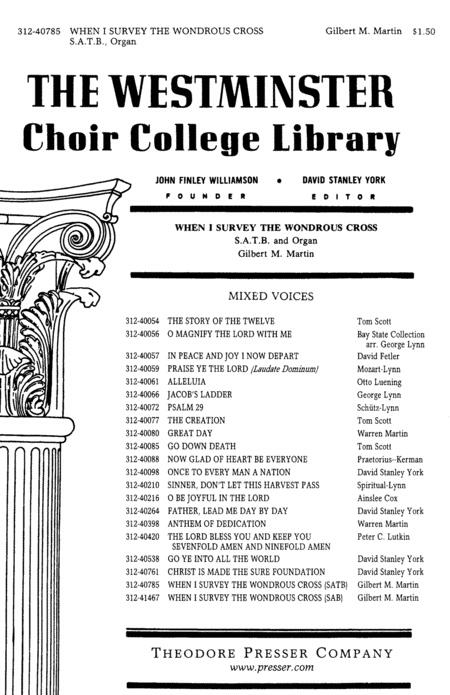 Westminster Choir College Library. Sacred, Choral. Piano reduction/vocal score. With Standard notation. 8 pages. Theodore Presser Company #312407850. Published by Theodore Presser Company (PR.312407850). ISBN 1598063197. Text: Isaac Watts. Effective, simple part-writing and exceptional use of dynamics has made this piece an icon of sacred choral literature. There is just no better way to express the meaning of the cross, particularly during Lent or Good Friday services. singing. You do need a good organist for this one! There's even an [optionally] a cappella section for those who love the sound. octave leap for basses on 'Christ my God'). Accompaniment is complimentary, and simple enough to not overshadow the beauty of the harmonies of the choir, even a small choir. Ranges for each part are moderate and attainable by high school or church choirs. 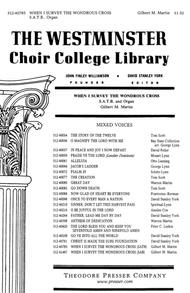 My seminary choir (in which I sing as an alumna) has done this as our signature piece each spring for almost 20 years now. Very highly recommended. 24 of 43 people found this review helpful. The first read thru insprired comments like Wow..Beautiful...Inspiring..moving, etc..Very well written..Anything Gilbert Martin arranges is awesome..I also play many of his organ pieces..Most sound very difficult but are not terribly hard to learn.
. The first two pages are men, women, and both, in unison, followed by some four part harmony of easy to medium difficulty. There is a brief section that splits into 8 parts, but is easily adaptable to four. The soprano goes up to a G once and an A at the end, but again, is easily adaptable, since those notes are doubled in the other parts. This piece has a simple and beautiful melody, rich harmony, moving text, and wide dynamic range, perfect for a special occasion worship service. The organ accompaniment is more difficult due to the five key changes, though none of the keys is particularly difficult in itself. 23 of 44 people found this review helpful. February 25, 2008 Great Sacred Piece! competent organist. Well worth doing!